Some solutions for Alaska’s housing shortage are exciting and innovative small-scale projects, like student-built housing in the village of Nikolai. Others are steadfast, long-term solutions that lay the groundwork for housing development statewide. Brian Wilson is the Executive Director of Alaska Coalition on Housing and Homelessness and knows about some of those long-term ideas. Full disclosure – Brian is married to another reporter you hear on Alaska Public Media, Elizabeth Jenkins from Alaska’s Energy Desk. Anne Hillman: Brian, communities around the state talk about housing and homelessness. Is that actually a problem? Brian Wilson: Yes, it’s a big problem in the state. You know, in the last two years we’ve really made a lot of improvements in our data reporting system that tracks homelessness across the state, and we’ve mapped out where our resources are. We’ve really seen that there’s been a rise in chronic homelessness in our state — so people who are consistently homeless and are trying to find a solution to that through a Housing First or a permanent supportive housing intervention. But we’ve also seen that those interventions just don’t exist, especially in the balance of state [which is everywhere outside of Anchorage.] The resources that we do have are in our urban hubs – Fairbanks, Juneau, and Anchorage for the post part. But for many areas, if someone is presenting as homeless, their closest intervention could be a thousand miles away. Anne: Other states have come up with different ways to address that. How do we develop the specific solutions? Is there a policy to look at? Brian: The first thing that we’re trying to advocate for is to get this conversation happening on a consistent basis at the legislative level. We’re one of the few states that doesn’t have a legislative committee assigned to housing and homelessness issues. And so what we’re really trying to push right now is to get that conversation happening consistently at the statewide level. In addition, we really want to have communities have this conversation at the local level. Every community by state statute is required to have a comprehensive plan in place. And those things typically cover land use, transportation, community facilities. The reason why they include those similarities is because that’s what’s required of them in their planning process by the statute. What we’re advocating for is to amend that statute to include housing and homelessness issues in there as this is a problem that every community is facing. Anne: So we have the conversation on the state and local levels, we figure out our needs. Then, how do we pay for it? Brian: As it stands right now, there are a lot of different agencies that address homelessness in some way through existing grant streams. But the problem is that those different grant streams are not really connected in an easy way for folks to access and leverage those funds together to put up new programs. And so what we’re calling for is called a funder’s collaborative. This is a best practice from many different states, where all the different agencies identify that the lack of supportive housing in our state is a problem and it’s a priority area. And we’re going to look at this from an interagency perspective where we work together to ensure that the funds that we do have, that we manage right now to address this issue, are as accessible as possible to communities that may have a very limited knowledge of how to access those funds. Anne: Will collaborating and coordinating funding streams be enough to solve Alaska’s housing problems, or do we need another source of money? Brian: We don’t have this pot of gold that we’re sitting on and not disbursing out. A lot of these existing grant streams are just keeping existing programs afloat. And there’s a lack of new programmatic money out there. What we’re trying to do — the long-range plan is how do we create a fund where we can have money for new programs out there. 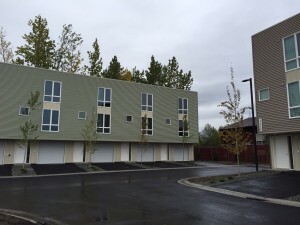 Alaska is one of only three states in the entire country that does not have a statewide housing trust fund or a statewide fund that is earmarked to address housing and homelessness issues on an annual basis. That’s something we need to start thinking about, even in these tough financial times, we need to start planning for how to solve this problem. Because if we don’t start investing in housing, we’re just going to continue to see more of the same, or even worse, the problem elevate to a larger level. Want to hear more Solutions Desk stories? Subscribe to the podcast on iTunes, Stitcher, Google Play, or NPR.